South America’s longest and most violent war. The war began in November 1864, when Brazil meddled in Uruguay’s internal affairs, an action that drew an immediate response from Paraguay’s bellicose dictator, Marshal President Francisco Solano Lopez. Lopez was convinced that Brazilian dominance of Uruguay would upset the balance of power in the region, and he reacted by blocking the Paraguay River and invading Brazil’s Matto Grosso Province. Not content with Brazil as an enemy, he provoked Argentina by crossing Missiones Province to attack Brazil from the west. On 1 May 1865, in response to Lopez’s attacks, Argentina, Brazil, and Uruguay formed an alliance and declared war on Paraguay. Paraguay’s initial thrusts into Brazil and Argentina were soon blunted, and Lopez was forced on the defensive for the balance of the conflict. Although vastly outnumbered, Paraguay’s army was modern and well-disciplined. Lopez began to send raiding parties of 100-200 men across the Paraña to harass the Allied camps. After some weeks of these attacks, in mid-April the Paraguayans made a major canoe-borne attempt to regain a sandbank battery position at Itapiru; this was repelled, and of the initial 800-strong assault force only 300 returned to their lines. After this success the Allies started a major river-crossing operation close to the confluence of the Paraguay and Paraña rivers, and the invasion of Paraguay began. Over a period of two weeks an army of 57,000 Allied troops (42,000 infantry and 15,000 cavalry) was carried across the Rio Paraña in two main waves. The crossings were supported by Brazilian Navy ironclads, and despite a few Paraguayan attacks the whole operation passed off without significant problems. This was something of a logistic miracle by the standards of the day: during the war in general the soldiers of both armies were transported, fed, and supplied very badly. The entire logistic system was still based on horses, with trains being scarcely used for the transportation of troops and only by the Paraguayans. From the accounts of participants we know that uniforms, weapons, and munitions. were supplied irregularly, and only the Brazilians would achieve a gradual improvement to their supply system before the end of the war. The Paraguayan retreat stopped at Estero Bellaco, where they had the two rivers Paraguay and Paraña protecting their right and left flanks. On the margins of the waterways a carrizal terrain of lagoons, mudflats, and sandbanks was dominated here and there by high hummocks and bluffs, from which artillery could fire down upon infantry struggling in the mud below. 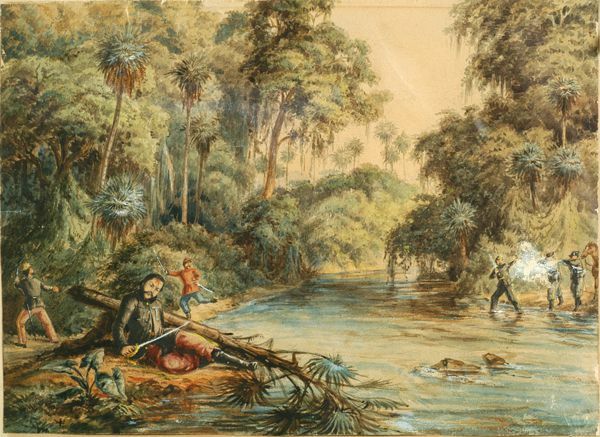 At Estero Bellaco, on May 2, Gen José E. Diaz with some 6,000 Paraguayans attacked about 8,000 Allied troops, and in particular the vanguard mainly composed of Gen Flores’ Uruguayans. The Uruguayan infantry battalions formed defensive squares and repulsed the attackers; the Paraguayans lost 2,300 men, but the Allied vanguard was more or less destroyed. After this punishing action the Allies moved a short distance north to the area around Tuyuti, where they built an immense camp partly defended with entrenchments and field fortifications. Lopez now assembled all the troops at his disposal, including all his best cavalry regiments and infantry battalions; this force of about 24,000 veterans was the best Paraguay had ever deployed. 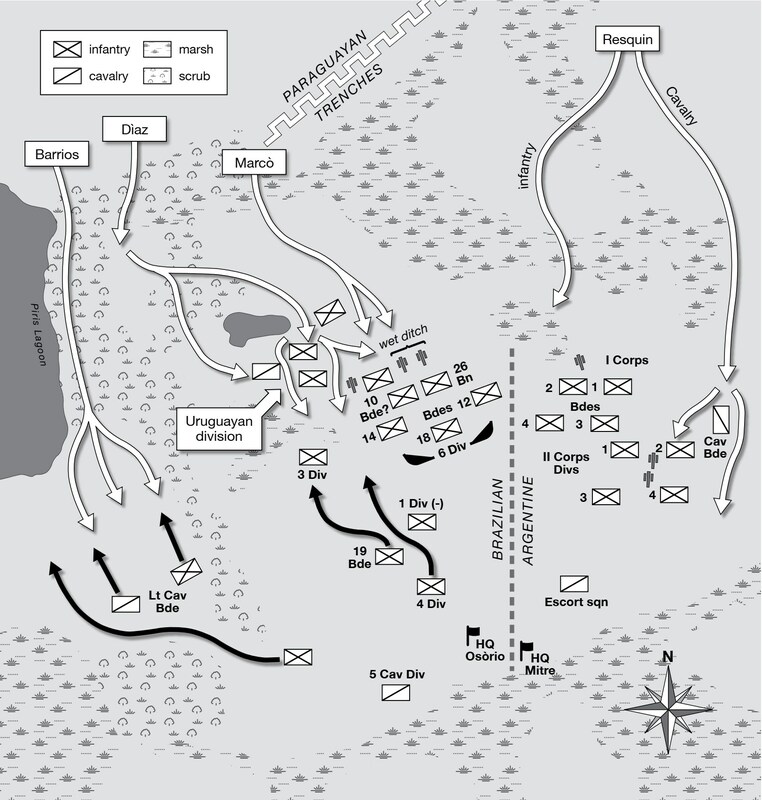 Lopez’s plan was simple: a surprise general attack against the Allied positions, with four attacking columns each led by cavalry. The 35,000-odd Allied soldiers in the camps (c. 22,000 Brazilians, 11,800 Argentines, and 1,200 Uruguayans or “Orientales”) were reorganizing for a further advance into Paraguay. The first battle of Tuyuti commenced on the morning May 24, 1866, when the attacking columns were commanded (right to left) by Gen Barrios, Col Diaz, Col Marco, and Gen Resquin. The first column to advance was that of Marco, aiming at the center of the Allied army; after having defeated the foremost Uruguayan infantry this was repulsed by Brazilian brigades, partly thanks to the intelligent protection of Maj Emilio Mallet’s artillery with a large wet ditch. The column of Diaz then attacked on Marco’s right, where it had to divide to pass around a lagoon. Striking the Allied left-center, it was defeated by the bulk of the Uruguayans and by Brazilian units brought up from the reserve, and was completely destroyed. General Barrios’s delayed hook around the Allied far left flank swept aside the few Brazilian units in its path, and almost reached the camps before being countered by the Brazilian reserve cavalry. The cavalry-heavy columns of Gen Resquin attacked the Argentines on the Allied right wing. One account states that the Argentine cavalry were routed when they fought dismounted; whatever the truth of that, the Argentine infantry certainly formed squares and repulsed the Paraguayan cavalry with great loss. The Paraguayans pressed home their attacks courageously, but were gradually driven back and in some cases surrounded by Allied counterattacks, before finally leaving the field. The most important battle of the war, at Tuyuti on May 24, 1866, was the greatest ever fought on South American soil, involving some 24,000 Paraguayans against 35,000 Allied troops. Casualty figures are approximate, and, given the rudimentary medical care available, the numbers listed for wounded certainly mask many additional fatalities. With these reservations, however, Tuyuti probably cost Paraguay some 13,000 casualties (nearly 55 percent), of whom at least half were killed, and the Allies about 2,400 killed and 3,000 wounded (about 15 percent) – a combined casualty ratio of 31 percent of those engaged on both sides. To put those figures in context: at “Bloody Antietam” in September 1862 the Confederates suffered about 30.4 percent casualties and the Federals around 17.7 percent, giving a combined ratio of 22.7 percent. After such severe and irreplaceable losses at this “South American Waterloo,” the Paraguayans were never again able to organize a major offensive operation against the Allies with any chance of victory. Their final defeat was simply a question of time, no matter the determination with which Lopez defended the national territory. He started to retire slowly, and blunted the Allied pursuit bloodily on July 18 at Boqueron. Here perhaps 6,000 Paraguayans under Gen Elizardo Aquino attacked a similar number of Argentines and Uruguayans led by the Argentine Gen Leon de Pallejas; casualties were very heavy on both sides, and both commanders were killed. Resuming their withdrawal, the Paraguayans built fortified batteries at many strategic points; when the Allies caught up these were defended stubbornly before any survivors tried to slip away. A typical example was the fort at Curuzu, attacked on September 1-3; supported by naval gunfire, some 8,000 Brazilian and 1,000 Argentine troops were landed, and took the fort from 2,500 defenders. The cost included the Brazilian warship Rio de Janeiro, which sank after hitting two Paraguayan mines. Paraguayan tactics were spectacularly vindicated on September 22, 1866, when some 17,000 Allied soldiers attacked 5,000 Paraguayans defending a double defensive line of fortified batteries anchored on the high bank of the Rio Paraguay at Curupayti. There was argument between the Brazilian and Argentine commanders over the plan of attack, and, despite supporting fire from the Brazilian ships the Allied assaults were repulsed with terrible losses. The Paraguayans had concentrated 50 artillery pieces and seven infantry battalions to defend the position; after breaking through the first line the Allied infantry were trapped on low, open ground under the guns of the dominating second line, and were slaughtered. The Paraguayans lost just 92 killed; Allied casualties were reported as 4,000 killed, with an even greater number wounded and abandoned when the Allies fell back. The Argentine troops suffered particularly badly, and their survivors remembered the action as badly planned and doomed from the outset. This defeat ensured that the war would last perhaps a year longer than it need have. A long pause in active operations would follow before the Allies could resume the war of maneuver. After this costly and demoralizing defeat the Allied army had to regroup and reorganize itself over many months during which it remained encamped around Tuyuti, though minor probes, raids, and bombardment of river targets continued. This long period of inactivity saw disease spread throughout the camps causing thousands of deaths, particularly among the Argentines and Uruguayans. Early in 1867, President Mitre of Argentina and President Flores of Uruguay were obliged to return to their capitals to confront internal opposition, and the supreme Allied command passed in February to the Brazilian Gen Luis Alves de Lima e Silva (later created Duke of Caxias) until Mitre returned in August 1867. Since his appointment as commander of the Brazilian Army in October 1866, Caxias had begun instituting reforms that noticeably improved its quality; he replaced inadequate officers, oversaw retraining and re-equipment, and improved at least to some extent the chronically inadequate supply system and medical corps. At the end of July 1867 a British diplomat reported that the army had 5,000-6,000 sick, but 45,000 Brazilians, 7,000-8,000 Argentines, and 1,000 Uruguayans in the field. A steady flow of about 2,000 reinforcements was arriving each month to keep these numbers up. Lopéz used this period to concentrate his last troops around his headquarters and main river fortress at Humaita, and to recruit new soldiers from the militia. This does not seem to have had impressive results, according to the same British correspondent, G. Z. Gould: his informants told him that of a total 20,000 Paraguayan troops only 12,000 at best were of adequate quality, the rest being old men, invalids, and boys as young as 12 years of age. Although the Paraguayans had previously captured numbers of Minié rifles, most still carried smoothbore flintlocks. The army was very short of horses, and those that they had were in bad condition. During the second half of 1867 the Allies remained basically stalled by the formidable obstacle of the great fortress of Humaita, which was the heart of Lopez’s defense. After returning to resume overall Allied command, Mitre favored a direct drive up-river carried and supported by the Brazilian Navy, but the Brazilian commanders were unwilling to risk warships and troop transports against Humaita’s strong artillery. Built on a superb defensive site commanding a sharp S-bend of the Rio Paraguay, this “Paraguayan Sebastopol” was an extensive complex of stone-built bastions and casemates mounting 114 artillery pieces distributed in 12 batteries, most of them dominating narrows protected by three chain-booms, two lines of explosive mines, and a stockade chicane. Before trying to force this passage the Brazilians insisted on land operations around the Paraguayans’ left flank, to cut the fortress’s lines of communication and supply from Asuncion. During a period of relative inactivity in November 1867, the Paraguayans launched an attack on the Allied entrenched encampments at Tuyuti. Although this achieved some penetrations it was numerically too weak to succeed, and was repulsed after each side had suffered about 2,400 casualties. In January 1868 President Mitre was obliged to return once more to Buenos Aires to deal with political opponents. Caxias was definitively appointed Allied commander-in-chief, gaining the freedom to conduct the campaign according to his own vision. He isolated Humaita by operations on its landward approaches, and on February 19 his fleet moved up-river. The ironclads bombarded the batteries, and after some setbacks and a good deal of damage they forced a passage; some then made the gesture of steaming all the way up to Asuncion. Alarmed, Vice-President Domingo Sanchez ordered the evacuation of the Paraguayan government from Asuncion to Luque, and in the following weeks many other citizens would also flee the capital. Although it always required a battle to do so, the Brazilian fleet was now able to pass back and forth past Humaita, to bombard and to land troops. Cut off from all sides and running out of food and ammunition, the Humaita garrison finally surrendered on July 24, 1868. In September, Lopez abandoned a defensive line along the Rio Tebicuary and fell back closer to the capital. His British engineer George Thompson constructed a fortified defensive line 22 miles (35km) south of Asuncion, stretching from the strong river batteries at Angostura, along the Pikysyry stream and 6 miles (10km) eastward toward the Ypoa Lagoon marshes. Meanwhile the Allied advance northward up the Rio Paraguay, accompanied by the Brazilian fleet, continued slowly but steadily. By December 1868 the Pikysyry line, supplied from Villeta, was held by about 12,000 Paraguayan troops with 85 guns; rather than attempting frontal attacks, Caxias then showed his talent. He shipped a strong part of his force across to the west bank; had them build a wooden “corduroy” road for some miles through the marshes to take them north; and on December 4 he shipped them back to the east bank at San Antonio, well behind the Paraguayan defensive line. Caxias then turned his army south, defeating Gen Bernardino Caballero’s much weaker Paraguayan forces in detail at Ytororo on the 6th and Avay on December 12. On December 24, Lopez rejected the surrender terms offered by the Allies and fled to Cerro Leon. After another Allied victory at Ypacarai on Christmas Day, Lopez personally led 10,000 men against more than twice that many Allies in a hopeless attack at Lomas Valentinas (Yta-Ibate) on December 27. On January 1, 1869 Brazilian troops entered Asuncion, which was completely occupied on the 5th, and subjected to looting. Two weeks later Caxias resigned his command, ostensibly due to ill-health; he seems to have argued against expending more lives and funds pursuing Lopez to the bitter end, but for Emperor Pedro II this was now a personal matter. The Paraguayan army retreated to the northeast but was defeated at battles at Caacupé and Piribebuy on 15 August 1869. The allied victory at Piribebuy under the Conde d’Eu, Gaston Luis Felipe d’Orleans, destroyed the Paraguayan army as an effective fighting force. Nevertheless, Lopez was able to rally remnants of his force and wage guerrilla warfare from the north. On 1 March 1870, a Brazilian cavalry unit cornered Marshal President Francisco Solano Lopez and his band at Cerro Cora. Lopez and his son were killed, and the war ended. The war demonstrated the ability of Latin American republics to wage modern war against each other on a large scale. Paraguay exhibited extraordinary resourcefulness, improvising as needed, building ships and armaments with its own resources, and continuing the war under the most adverse circumstances. Brazil and Argentina organized large armies and worked out problems of allied commands. The war devastated Paraguay, which lost between 8.6 and 18.5 percent of its population, as well as 38 percent of its national territory. Moreover, Paraguay’s vibrant prewar economy was wrecked and the country plunged into a period of political instability. Argentina, however, made significant territorial gains with relatively little disruption of its economy or political stability. The impact of the war on Brazil was mixed: territory was gained, and the military gained new respect, but the cost of the war in Brazilian lives and funds was high. Correction: the war meant an unparalleled demographic decline for Paraguay. The population was reduced, according to the data, by at least 50% and it could even be claimed that two thirds of the population were lost (including migrant bleeding). We also saw that there were more women than men, but that only in the older groups did this ratio reach four women per man. Paraguay had to be reborn from its ashes and it was on the shoulders of these little more than a hundred thousand people that this titanic task fell.